Obituary for CPO Earl Mason Freeman, Jr. USN Ret. | Beach Funeral & Cremation Services, Inc.
CPO Earl Mason Freeman, Jr. USN Ret. On Sunday, October 7, 2018 at 11:40 a.m., CPO Earl M. Freeman, Jr., USN RET quietly and peacefully slipped into eternal rest. He was 96 years old. His life spanned decades of our American history. Earl served his country proudly in World War II, the Korean War, and the Vietnam War. While serving in the Navy Reserve, he also gave 29 years of devoted full-time service as a Federal employee, retiring in 1973. Following retirement, Earl and his wife Elenora became entrepreneurs, establishing the Washington, D.C.-based Early Bird Liquors. Earl was born May 2, 1922 in Washington, D.C., the only child of Helen A. 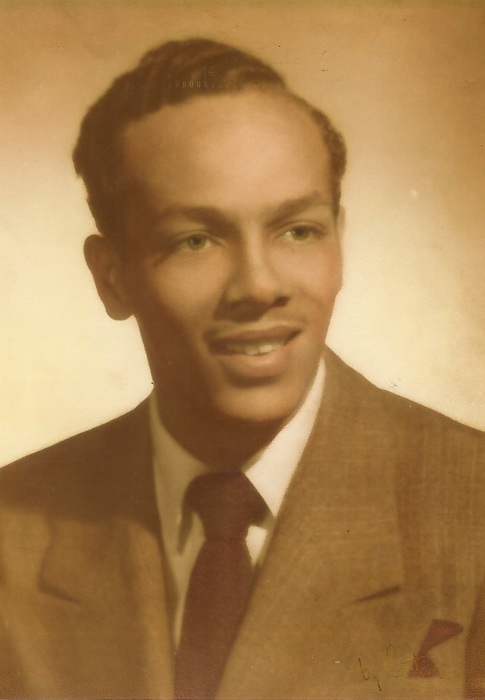 (Hall) Freeman and Earl Freeman, Sr. Graduating from Armstrong High School in Washington, D.C., Earl, Jr. later attended the historic Howard University. He was a member of the Omega Psi Phi Fraternity, Inc., and later became a Life Member of the Fleet Reserve Association. He was a lover of life, including love of family, care of community, and an appreciation for discovery. Earl was an ardent lover of jazz and a talented hobbyist who dabbled in a little bit of everything from carpentry, to gardening (he loved roses! ), to model trains and radio-controlled airplanes, to sportscars, to photography, to sewing (he was a tailor’s apprentice when entering college). In many ways he was an autodidactic, taking it upon himself to learn a subject without the benefit of a formal teacher or coach. He was self-made and self-reliant. From his education to his career, given his skill with every kind of tool that could style wood or metal, brick or cement, Earl was engaged with the world as a man who would be its master. Earl was also a devoted husband of 70 years to Elenora Frances (Akers) Freeman, who passed away on May 21, 2018. Many knew Elenora as “Kitty,” but Earl knew her affectionately as his “Sissybum”—or, as the French say, “c’est bon” for this is good. They loved together, supported family and neighbors together, and traveled together, including excursions abroad and many ski trips with friends to Colorado, Utah, and Canada. They had a great respect for the stability of community, hosting casual gatherings like their famous July 4th barbeques for neighbors and friends. Earl is survived by his daughter, Paula E’Laine Freeman Younger; his grandson and “buddy,” Cameron Freeman Younger; his son-in-law, Victor B. Younger, and a host of family and friends throughout the Virginia and Washington, D.C. areas. A special thank you to the Virginia-based assisted living facility Kings Grant House for their loving care and support. Additional thanks to Intrepid Hospice Care for their dedication and professionalism. Memorial donations may be made to the American Diabetes Association; American Heart Association, Inc.; or the Dorothy Cotton Jubilee Singers.